Abu Dhabi: Artisans from various states of India displayed traditional handicrafts at an event in the capital on Monday evening. The colourful handicrafts represented the rich cultural diversity of India, a senior Indian diplomat said. This artistic skill has been passing on from generation to generation, said Smita Pant, deputy head of the mission at the Indian Embassy in Abu Dhabi while inaugurating “Indian Handicraft Fair” organised by the embassy in association with the Indian Business and Professional Group (IBPG) in Abu Dhabi and Indian Pavilion at Global Village in Dubai. She said seven million people, mainly women in rural areas, find livelihood in traditional handicrafts sector in India. Padmanabha Acharya, president of the IBPG who welcomed the gathering, said the event would facilitate networking opportunities for artisans from India to expand their business in the UAE. Dr B.R Shetty, chairman of the IBPG, officials from General Women’s Union (GWU) and many other prominent personalities attended the exhibition. Some of the artisans displayed their artisanship by making their traditional items in front of the audience in the event. Many of them have been visiting the UAE for several years to sell their products in trade exhibitions and similar events. 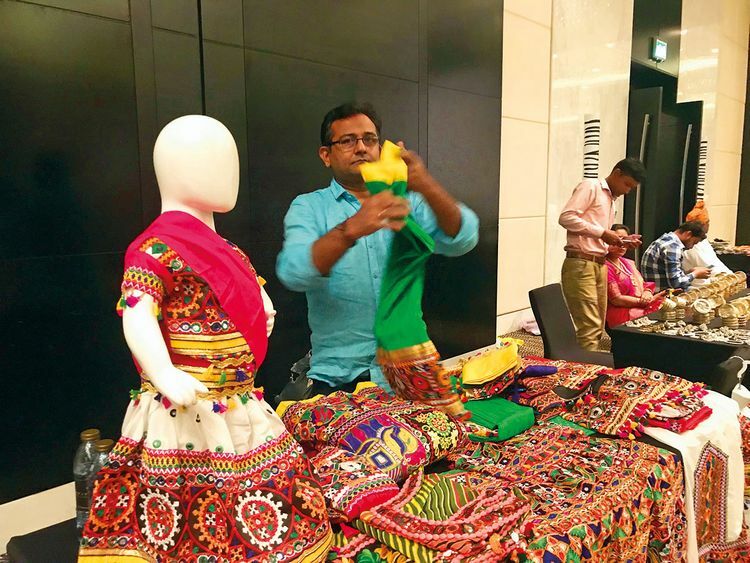 Sanjay Rathore, who sells colourful Indian traditional dress from the western Indian state of Gujarat, said he has been regularly visiting the UAE for 19 years. “Indians and Arabs are fond of these beautiful dresses for women and kids [with price ranging from Dh100 to Dh800,” he said. Faisal Mir, who sells famous Kashmiri shawls and women’s clothes from North Indian State of Jammu and Kashmir, said Gulf nationals always his products with price ranging between Dh700 to Dh10,000. “Women’s clothes have more takers, “said Mir who has been visiting the UAE for eight years.